As a verse novelist, I take special delight in the Academy of American Poets' annual spring celebration of this very special literary art. If you want to discover ways to brighten your day with poetry, do visit their amazing website. 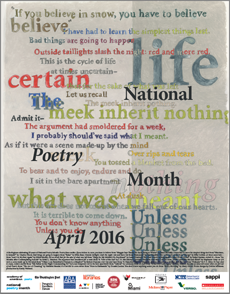 Coming up this Thursday is a favorite event of mind: AAP's "Poem in Your Pocket Day." The moon's full gaze on me. You can find the rest of the poem on the Poetry Foundation website.